This unique estate wedding band features abstract floral mountings each set with a dazzling round cut diamond. Pairs of baguette cut diamonds are bezel set into the shoulders of the band. 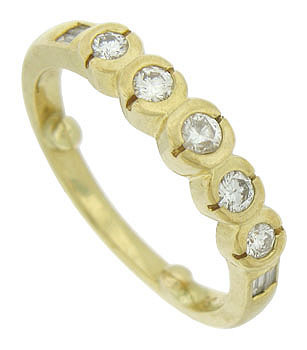 The wedding ring is fashioned of 14K yellow gold and set with .17 carats of diamonds. 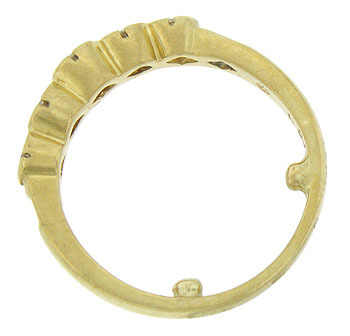 The ring measures 3.92 mm in width. Circa: 1970. Size 4 1/4. We can re-size.